Apparently this is the image of co-sleeping as The Milwaukee Health Department wants you to see it. The second-leading cause of infant mortality in Milwaukee is SIDS, or sudden infant death syndrome, which often results from ”unsafe sleep,” according to the health department’s website. I agree that the images on this page definitely portray "unsafe" co-sleeping. But they could very well put an image of a child in a crib with pillows and loose blankets and it would likewise be "unsafe" crib sleeping. It's an ad that is indeed shocking but not informative in the way it should be. 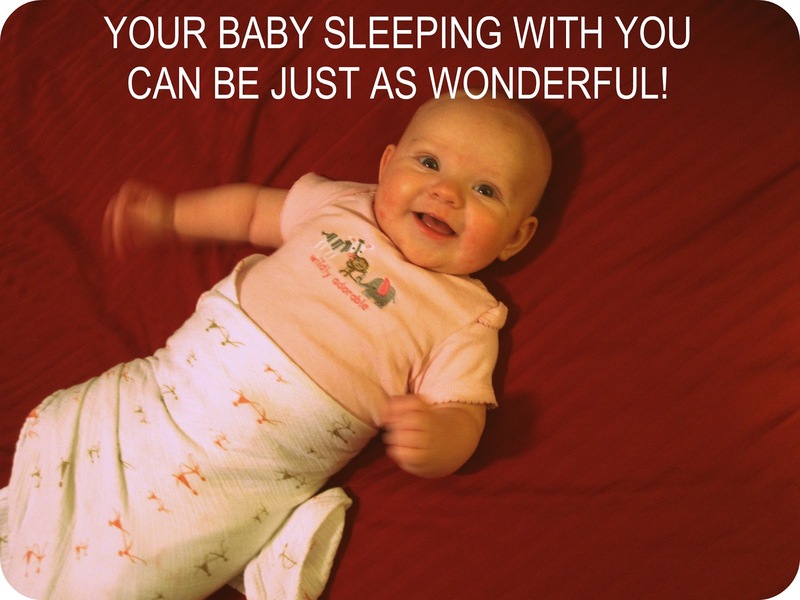 Co-sleeping (when done safely) actually decreases the risk of SIDS. "Worldwide research shows that the SIDS rate is lowest (and even unheard of) in countries where co-sleeping is the norm, rather than the exception" (askdrsears.com). 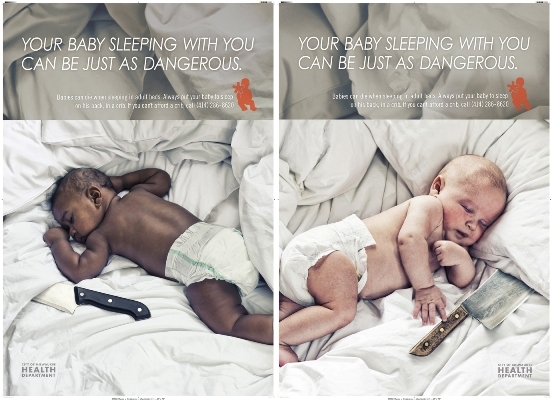 Instead of promoting "safe sleeping" in all its forms, this ad targets co-sleeping as the root of all evil. They had good intentions but the result is completely off base. Instead of spending money on an ad campaign aimed at scaring the community into banning the practice and making parents who do co-sleep feel like would-be murderers, why not educate parents families how to do it safely? After all, co-sleeping (when done safely) has wonderful benefits including better sleep for parents and baby, long term emotional health, decrease in the risk of SIDS, and it has been found in some studies to be safer than crib sleeping when done properly. There are also many benefits for breastfeeding mothers. It is fascinating to see the differing views of "safe sleeping" by different cultures. Milwaukee would have you believe co-sleeping is like letting your newborn play with a butcher's knife, while mothers in countries where bed sharing/co-sleeping is the norm gasp at the thought of crib bumper use (an accessory about as common as pacifiers here in the states). I'm not suggesting that all parents adopt the practice of co-sleeping, it isn't for everyone, nor am I suggesting that all mothers need to throw out their crib bumpers. What I do think is that we need to empower parents to make safe decisions when choosing the sleeping arrangements for their baby, whether it be in a crib in their own room, in a crib/bassinet next to the parent's bed, or in bed with mom and dad. Turns out this ad can serve a larger purpose than shock value. It just so happens that in this photo you will see almost all of the things you should NOT do when co-sleeping. But, as a teacher, I learned that non-examples are the worst kind of examples. So, here is a list of the things I've learned one should do when sharing a bed with their baby. (These tips were shared with me by my midwife, birth instructor, and pediatrician). 1. Place baby on his/her back. 2. Bedding should be tight fitting to a firm mattress (no large duvets, heavy blankets, large pillow tops, or feather ticks). 3. Use light blankets or sheets. Keep all blankets and pillows away from the baby's face. 4. 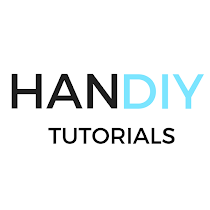 Take precautions so the baby doesn't roll off the bed or get trapped between mattress and wall. 5. Dress baby lightly. (A great rule my pediatrician shared is that you shouldn't dress the baby in anything heavier than what you are sleeping in). 6. Have the baby sleep next to the parent that is the most aware of the baby (usually mom). This parent should sleep facing the baby. 7. Do not sleep with your child if: you under the influence of any drug or alcohol, you are a heavy sleeper, you are overly exhausted, or if you are a smoker. 8. Oh... and leave the butcher's knife in the kitchen. What do YOU think of the Milwaukee ad? What are the sleeping arrangements in your home? How do you practice safe sleeping? *Our family practices co-sleeping with our baby. We exclusively shared our bed with our baby from months 1-3. Now, she sleeps next to the bed in a bassinet for the first portion of the night and comes into the bed for the latter part of the night. Our baby sleeps in his Fisher-Price rock 'n play sleeper right next to me. He goes back to sleep in there after eating except for the last feeding, when Dad is gone for school. Then I feed Baby in bed and snuggle with him until he wakes up for the day. We use the rock n' play too! We LOVE it. It is the perfect height and I can set her in it while I cook, clean, etc. It's also her favorite place for naps and it's so easy to take with us when we visit Grandma. Thanks for sharing! Aren't early morning snuggles the best? !